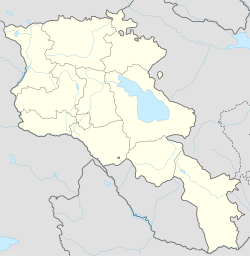 Ijevan is a city in northern Armenia. It was named Istibulagh and Karavansara. It is the capital of Tavush region. The city's current name, Ijevan means "inn" in Armenian. The former name Karavansara means "inn" in Persian. In 2009 there were 20,500 people. This made it the most populated city in the province. Ijevan has a railway station since 1870. Tradition says that about 2000 years ago, King Artavasdes I built a city here. A branch of Yerevan State University is in the city. Makaravank Monastery of the 10th century in Achajur village 16 km north of Ijevan. This purple and green stone complex in the forest above the village is a very popular destination. Arakelots Monastery of the 13th century few kilometers north of Ijevan near Kirants village. Kirants Monastery of the 8th century 10 km north of Ijevan. Gandzakar village monastery few kilometers south of Ijevan. Yenokavan Canyon, near Yenokavan village north of Ijevan. Characterized with beautiful cliffs, caves, forests, rivers and cascades. "Anapat cave" has a style of pre-Christian unique carvings which resemble Mayan and Aztec works. There are small rest houses and a modern resort in Yenokavan canyon. This page was last changed on 12 December 2018, at 18:48.